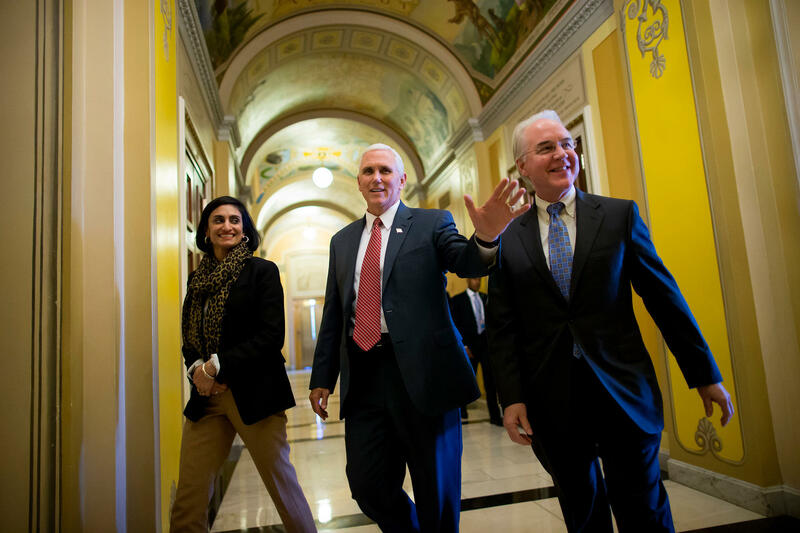 Seema Verma, the administrator of the Centers for Medicare and Medicaid Services, joins Vice President Pence and Health and Human Services Secretary Tom Price on Capitol Hill to advocate for the GOP health overhaul bill. House Republicans approved their plan to replace the Affordable Care Act on Thursday. Here's a rundown of key provisions in the American Health Care Act and what would happen if the Senate approves them and the bill becomes law. The bill would no longer require people to buy insurance through the marketplaces created by the Affordable Care Act, also known as Obamacare, if they want to use federal tax credits to buy coverage. It also would eliminate the tax penalty for failing to have health insurance coverage, effectively doing away with that requirement altogether. In place of that mandate, the bill encourages people to maintain coverage by prohibiting insurance companies from cutting them off or charging more for pre-existing conditions as long as their insurance doesn't lapse. If coverage is interrupted for more than 63 days, however, insurers can charge people a 30 percent penalty over their premium for one year. The House Republican plan would eliminate the income-based tax credits and subsidies available under the Affordable Care Act, replacing them with age-based tax credits ranging from $2,000 a year for people in their 20s to $4,000 a year for those older than 60. That means some people will see their costs go up while others would pay less, depending on your age and where you live. This Kaiser Family Foundation interactive map shows how the change would play out across the country. The map shows that a 27-year-old who makes $30,000 a year would see costs rise about $2,000 in Nebraska but fall by about the same amount in Washington state. A 60-year-old, however, would see costs rise almost everywhere, with increases of almost $20,000 a year in Nebraska. Both Kaiser and the Congressional Budget Office found that, on average, older people with lower incomes would be worse off under the Republican plan than under the Affordable Care Act. The bill eliminates nearly all the taxes that were included in the Affordable Care Act to pay for the subsidies that help people buy insurance. Those cuts, which add up to about $592 billion, include a tax on incomes over $200,000 (or $250,000 for a married couple); a tax on health insurers and a limit on how much insurance companies can deduct for executive pay; and a tax on medical-device manufacturers. The AHCA would make dramatic changes to Medicaid, the federal-state health program for the poor and disabled. The Affordable Care Act allows states to expand eligibility for Medicaid to single, nondisabled adults with incomes slightly above the poverty line, with the federal government picking up most of the cost. That meant single adults who earn up to $15,800 a year could qualify in the 31 states, plus the District of Columbia, that expanded Medicaid. About 10 million people enrolled under that expansion. The Republican plan would gradually roll back that expansion starting in 2019 by cutting the federal reimbursement to states for anyone who leaves the Medicaid rolls. People often cycle in and out of the program as their income fluctuates, so the result would likely be an ever-dwindling number of people covered. The House bill also converts Medicaid from an entitlement program, in which the government pays all the health-related costs for those who qualify, to a grant program. The federal government would give states either a set amount of money for each Medicaid enrollee or let them choose to receive a fixed-dollar block grant. The Congressional Budget Office estimated in March that the bill would cut Medicaid spending by $880 billion. The AHCA maintains protections for people with pre-existing conditions, with some important exceptions (see waivers, below). That means that someone with high medical expenses pays the same premium for the same policy as anyone else his age in his area. This section of the bill essentially amounts to an optional, state-level full repeal of Obamacare. It would give states the ability to apply for a waiver that lets them opt out of most of the regulations and consumer protections that were included in the Affordable Care Act. States could apply for waivers that would allow insurance companies in their states to do three things: 1. Charge older people more than five times what they charge young people for the same policy; 2. Eliminate required coverage, called essential health benefits, including maternity care, mental health and prescription drugs, that were required under the Affordable Care Act; and 3. Charge more for or deny coverage to people who have pre-existing health conditions, such as cancer, diabetes or arthritis. The waivers could also impact people with employer-based insurance, because insurers could offer policies that have annual and lifetime benefit limits, which are banned under the Affordable Care Act, and some companies may choose those policies for their workers to lower premiums. States that get waivers would very likely see insurance companies offer many more policy options, some with fewer benefits and lower premiums. Those states would be required under the law to create some other way to ensure that people with expensive illnesses are able to get health care, and the law provides up to $138 billion over 10 years for such programs, typically called high-risk pools. However, an analysis released Thursday by consulting firm Avalere Health concludes that that amount would be inadequate for providing full health coverage for the number of people who now buy insurance in the individual market and have medical problems. The House approved the bill Thursday without a full Congressional Budget Office analysis of its costs and how many people would be covered. The CBO report from March concluded that over 10 years, 24 million fewer people would be covered under the bill who otherwise would have had insurance under current law. That analysis also predicted that the House bill would cut federal deficits by $337 billion over those same 10 years. However, changes to the bill since then would allow states to accept block grants for Medicaid; add about $38 billion for high-risk pools and maternity and childbirth care; and offer states waivers from regulations created by the Affordable Care Act. It's unclear how much these changes would affect the original CBO score. 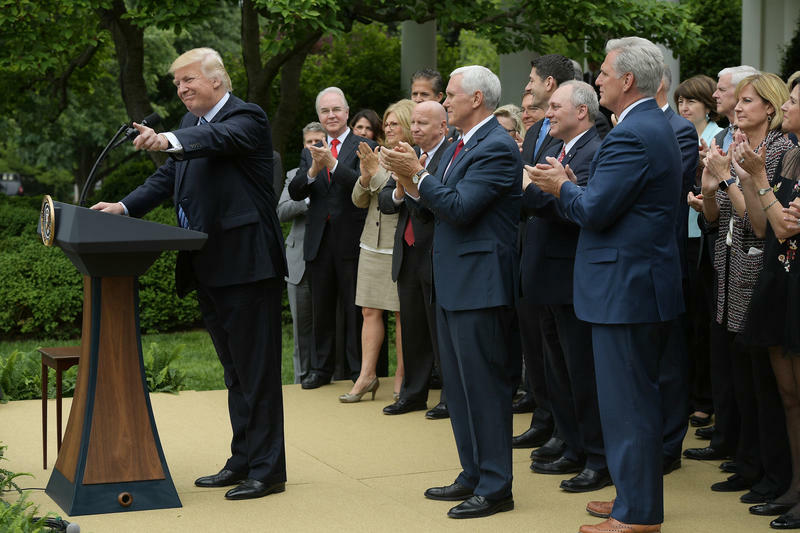 President Trump and congressional Republicans celebrated in the White House Rose Garden today after the House narrowly passed health care legislation to replace the Affordable Care Act. PRESIDENT DONALD TRUMP: This is a great plan. I actually think it will get even better. And this is - make no mistake. This is a repeal and a replace of Obamacare. Make no mistake about it. SIEGEL: That bill now goes to the Senate. And here to explain what is in the bill and how it's likely to change is NPR's health policy correspondent Alison Kodjak. Hiya. SIEGEL: House Republicans did today what they failed to do back in March when House Speaker Ryan had to pull the bill for lack of votes. What changed the bill so much to make the difference? KODJAK: Well, the original bill - the conservative wing of the House Republicans which are known as the Freedom Caucus really thought it kept way too much of Obamacare in place, and so they didn't like it. And then the more moderate side was worried about preexisting condition protections and other regulations that are in Obamacare being protected. And so they couldn't get the votes together at that point. So what they did in the meantime is basically create a compromise where state governors can apply for waivers to get out of those Obamacare regulations, those protections for consumers, which pleases the Freedom Caucus because it gives people more freedom to buy different kinds of insurance. But it also technically in the federal regulation keeps all those protections for people with preexisting conditions. SIEGEL: Well, the Congressional Budget Office said that the earlier version of the bill would have cost less than Obamacare, but it would cover 24 million fewer Americans. Why don't we have a clear idea of what impact this version of the bill would have? KODJAK: ...More money in the bill, but - and may - in those states that go for waivers, have fewer people covered even. KODJAK: It's the official scorer. SIEGEL: ...If it becomes - if this bill were to become law as it is, who would be the big winners and who the big losers by its passage? KODJAK: Well, the big winners would be younger, healthier people who would probably see their insurance premiums go down because they wouldn't be subsidizing people who are older and sicker. And those are exactly the people who might lose - are the older, sicker people who would see their subsidies really go down so that they would have to pay much more for insurance and people on Medicaid. There's Medicaid expansion in the - in Obamacare, and that's being rolled back in this plan. SIEGEL: The bill now goes to the Senate where Republicans have a much slimmer lead - 52 of the hundred seats. Do they need, in this case, just 51 to win in the Senate, by the way? KODJAK: They need just 51. SIEGEL: What's likely to change in the bill over there? KODJAK: Well, there are a lot of senators who are already saying they're very worried about that Medicaid rollback, the Medicaid expansion rollback, so that's one thing that's going to be on the list of things that may change. And then there might be some more protection for people with preexisting conditions in these state waivers because there are a lot of members of the Senate who say they are worried about people losing coverage. SIEGEL: OK. NPR health policy correspondent Allison Kojak, Thanks. (SOUNDBITE OF MASSIVE ATTACK'S "EXCHANGE") Transcript provided by NPR, Copyright NPR. The House voted Thursday to narrowly approve a Republican-drafted measure that would eliminate many of the provisions of the Affordable Care Act — the first step toward keeping one of President Trump's campaign pledges and a victory for GOP lawmakers who have long railed against Obamacare, as the ACA is commonly known. The vote was 217-213. The measure moves to the Senate, where its fate is far from certain — and where top lawmakers in both parties are already signaling that there is a long legislative process ahead.